Barreling toward New York, the high-speed electric train click-clicked through Port Richmond, bobbing and weaving at 65 mph, as it powered toward Frankford Junction. And then it derailed. The date: Sept. 6, 1943. 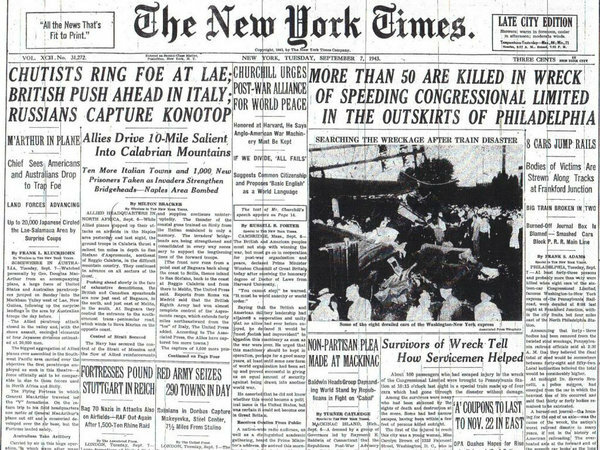 Seventy-two years before Tuesday night, when Amtrak Train 188 slid off its tracks, leaving at least five people dead and dozens more injured, a similar train in a similar spot met a deadlier fate: 79 people killed and 116 wounded in one of the worst rail disasters in U.S. History. The Pennsylvania Railroad train, the Congressional Limited, excited travelers with its advertised unprecedented speed of 65 mph. In Washington, D.C, where it originated (same as Train 188), riders were so eager to take a spin that an extra car was added to accommodate the crowd. Investigators later would say the older car’s axle couldn’t handle the speed and snapped just as it approached Frankford Junction. As of Wednesday morning, officials aren’t certain how Amtrak Train 188 derailed. The Amtrak train was carrying 238 passengers at it approached Frankford Junction. The Limited was carrying 541 passengers as it approached Frankford Junction. It would take 26 hours before the rail traffic returned to normal in the fall of 1943. And it would be 72 years before the city would collectively grieve over a deadly train crash again. From Eerily similar rail disaster occurred 72 years before at same junction.